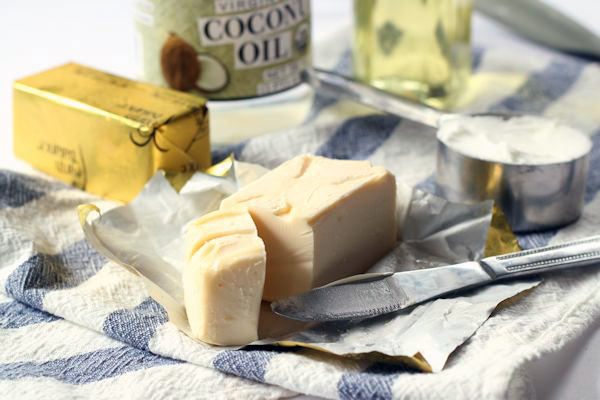 Not all fats are created equal and lard and hydrogenated vegetable oils are not on the top-list of "healthy fat choices". In contrast to said even more dreaded partially hydrogenized vegetable fats, which contains a whopping 13.2g of transfats per 100g, lard is yet mostly trans-fat free. That's a good thing, right? After all, high trans-fat intakes have been associated with increased inflammation and cardiovascular disease (Hu. 1997; Lopez-Garcia. 2005. Now, while experimental evidence confirming negative effects in humans is non-existent, negative effects have also been observed in controlled animal experiments. It is thus more than reasonable to assume that of two of the most commonly used fat sources for cooking, i.e. lard and hydrogenated vegetable-shortenings, the former, the trans-fat free 100% "natural" fat source should be the healthier one. To check the validity of this hypothesis, scientists from the University of Toronto fed male Wistar rats for 14 weeks diets which contained either (1) high vegetable fat (HVF, 60 kcal% from vegetable shortening) or (2) high lard fat (HLF, 60 kcal% from lard). A group of rats that received the normal-fat chow (NF, 16 kcal% from vegetable shortening) served as control (see Figure 1). 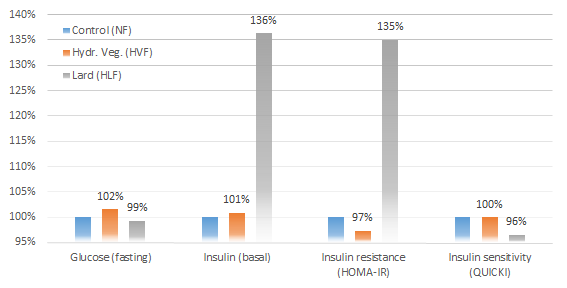 Body weight, food intake, adipose tissue mass, serum 25[OH]D3, glucose, insulin and fatty acid composition of diets were the scientists' main outcome data - data that confirm that not everything we take for granted will actually stand the test of science. 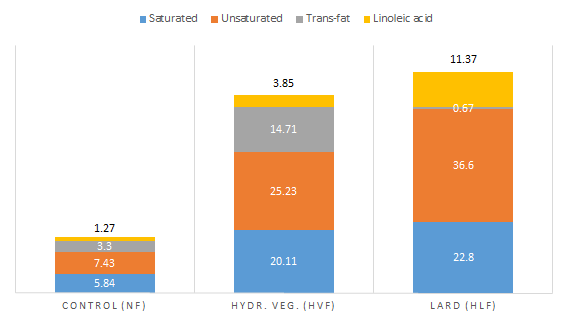 Figure 2: Body weight and fat gain over 12 weeks on control (low fat) or high fat diets w/ lard (HLF) or hydrogenated vegetable oils (HVF) as main fat sources (Kubant. 2015). In contrast to what common sense would dictate, the rodents in the lard group were not leaner and healthier. In fact, the data in Figure 2 tells you that the exact opposite was the case: The rodents on the high lard diet gained significantly more body weight and - more importantly - body fat and did not, as some may now speculate, simply store the extra energy away instead of having it float around in the blood and ruin their insulin sensitivity (see Figure 3). So, basically, the scientists, who had even speculated that lard, due to its naturally high vitamin D content "may act to reduce the metabolic consequences associated with obesity, as suggested by other investigators" (Kubant. 2015), had to realize that their prediction was wrong. Whether lard is simply unhealthier or whether the effect was a results of the comparably lower food intake of the vegetable shortening group is difficult to say. What we do know, however, is that the animals who were on the lard diet consumed more calories than the HVF group. That 1g/day of extra food, however, was enough to have the scientists conclude that the rats have a strong preference for the taste of fat sources containing long-chain fatty acids (that is, oleic and linoleic), but by no means enough, to fully explain the significant difference in weight and body fat gain. 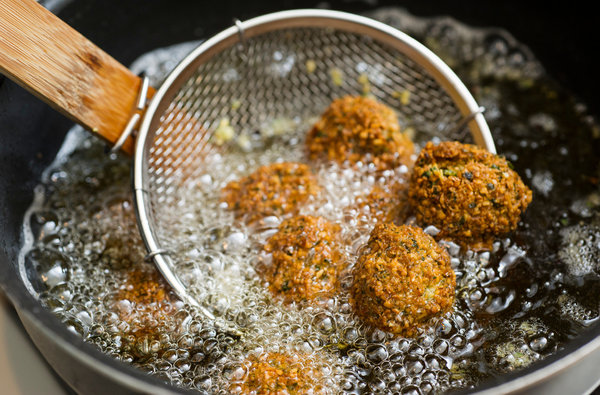 The Quest for the Optimal Cooking Oil: Heat Stable, Low PUFA & Cholesterol Free - High MUFA Sunflower / Canola, Olive, Coconut & Avocado Oil Qualify for the TOP5 | Learn more! So lard is much worse than transfats? I wouldn't dare making a general statement about lard vs. vegetable shortenings based on this study. One thing I would like to remind every saturated animal fat worshipper of, however, is that his beloved "saturated fat sources" like lard are in fact hardly saturated at all. The common lard, the scientists used in the study at hand, for example, has higher amounts of polyunsaturated fatty acids in it than the average vegetable shortening. Its (by the saturated fat lovers dreaded) content of omega-6 fatty acids in the form of linoleic acid, which is currently everybody's favorite scapegoat for being obese, diabetic or whatnot, is even three times higher! What we must not forget, either, are the divergent results about the fattening effects of transfats from monkey and rodent studies. While the one existing monkey study showed higher levels of intra-abdominal adiposity and insulin resistance in monkeys fed trans fatty acids (TFAs) for 6 years under a controlled feeding regimen (Kavanagh. 2007), a more recent study in rats found that dietary TFAs fed ad libitum (as much as the rodents wanted) did not influence food intake or body fat accumulation (Ochiai. 2013). Now, monkeys are more reliable than rats, right? Well, yes, but if the monkeys are on an energy restricted and the control diet was no lard diet, but rather the "perfect monkey diet", the rodent study with its realistic ad-libitum access to food and a diet composition that was more akin to what people eat these days becomes increasingly attractive. Overall, however, it doesn't really make sense to use any of these studies to speculate about the practical significance Kubant's rodent study has for men. If you asked me, it is not even relevant, anyways, because neither lard nor hydrogenated vegetable oils should be a regular part of your diet | Learn why in a previous SuppVersity Article or tell me what you think on Facebook! Hu, Frank B., et al. "Dietary fat intake and the risk of coronary heart disease in women." New England Journal of Medicine 337.21 (1997): 1491-1499. Kavanagh, Kylie, et al. "Trans fat diet induces abdominal obesity and changes in insulin sensitivity in monkeys." Obesity 15.7 (2007): 1675-1684. Kubant, R., et al. "A comparison of effects of lard and hydrogenated vegetable shortening on the development of high-fat diet-induced obesity in rats." 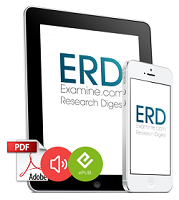 Nutrition & Diabetes 5.12 (2015): e188. Lopez-Garcia, Esther, et al. "Consumption of trans fatty acids is related to plasma biomarkers of inflammation and endothelial dysfunction." The Journal of nutrition 135.3 (2005): 562-566. Ochiai, Masaru, et al. "Effects of dietary trans fatty acids on fat accumulation and metabolic rate in rat." Journal of oleo science 62.2 (2013): 57-64.